Experience one of the oldest towns in Wyoming at this historic vacation rental home in downtown Laramie. Originally a stone stable built in 1883, this building was later converted into apartments and newly renovated to provide the modern conveniences and furnishings you desire. This 2-bed, 2.5-bath condo includes 2 queen beds and a loft with 2 twin beds to accommodate an unforgettable 6-person vacation. After exploring the beautiful old-timey city of Laramie, relax in your screened-in gazebo! 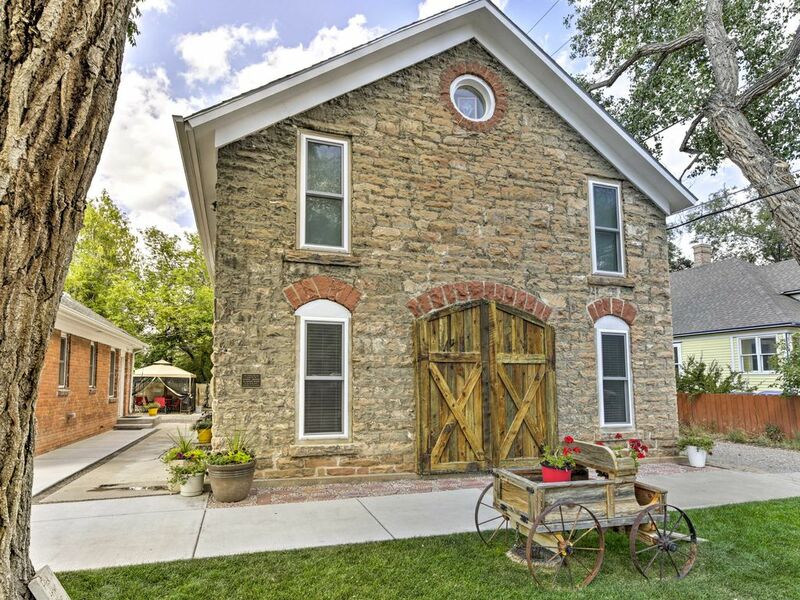 You won't be able to resist falling in love with this historic home as soon as you see its beautiful stone wall exterior and decorative barn door. The building is perfectly reminiscent of its vintage roots while also displaying evidence of contemporary renovation. In the living area, take your pick between 2 adorable rocking chairs and a comfy couch. Unwind by catching your favorite show or watching a Netflix episode on the flat-screen cable Smart TV! Walk through the arched doorway connecting the living room to the fully equipped kitchen, featuring lovely countertops and a variety of dishware. Prepare homemade feasts in the modern eat-in kitchen and enjoy meals at the 4-person dining table! When you come home from your Laramie adventures, rejuvenate in the screened-in gazebo. The glass table with chairs is the perfect spot for a late afternoon snack and happy hour drinks! Recharge for the next day in your choice of 2 queen beds. Two kids or other travelers can get comfy in the loft's 2 twin beds! This building is on the National Register of Historic Places and is owned by the Laramie Plains Museum Association. All rental proceeds go to the Laramie Plains Museum Association. As an old Wyoming town, Laramie is a great destination for historic attractions. The city was founded by the Union Pacific Railway in 1868 - visit the Laramie Historic Railroad Depot to view a small museum containing art exhibits and rotational community events. Walk just 3 blocks to immerse yourself in downtown Laramie and browse local shops, restaurants, and more historic sites. The vacation rental condo itself sits across the street from the historic Ivinson Mansion, now the Laramie Plains Museum! You can reach the University of Wyoming campus to catch a football game by walking 3 blocks in the opposite direction of downtown. LaBonte Park is also a 5-minute walk away, a lovely family-friendly area with a skate park, playground, and sports fields. Embark on an outdoor adventure in Medicine Bow National Forest 40 minutes away. Hiking, hunting, fishing, skiing, and snowmobiling are just some of the memories you can make in nature. - A screened-in gazebo and gas grill available during the summer months! - This building is on the National Register of Historic Places and is owned by the Laramie Plains Museum Association. All rental proceeds go to the Laramie Plains Museum Association. We came for a weekend ski trip. Everyone had their own space. The condo was lovely, well thought out, and comfortable. They have taken care to leave a good selection of forgotten items for your convenience. The condo was spotless, the beds were very comfortable and we all agreed it was the nicest VRBO that we’ve stayed at. We will likely be back next season. Thank you! The property is not for folks that have problems with stairs. We had kids and adults in our group and enough room for all. Nice luxury of the 3 bathrooms and parking at the door. Safeway close by for groceries. Great keyless entry. After 2 days of skiing we had plenty of clothes to be washed, laundry facility was excellent. Joyce let us borrow her crock pot and it was awesome to have a homemade hot meal when we returned from skiing! Doug and Joyce put a lot of thought and care into these condos to make sure everything goes well. Has everything a family might need in each room. Quiet, clean, and plenty of room for a family. Enjoyed the history of it as well! Beautifully remodeled, clean, and functional. Four of us, my daughter, her husband, my husband, and myself stayed here for a couple days around Christmas when we came to Laramie to celebrate the holidays with my family. My mom had a full house, so I found this ideal option for the four of us to stay. Beds were comfortable and loved having 3 bathrooms!